Charles Dow that is. Famously, he created the first ever index of 12 industrial companies in 1896. 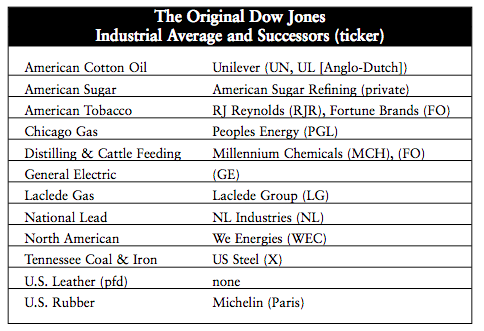 120 years later, Dow Jones Industrial Average has 30 stocks, but only 5 of them (16%) are really industrial. Machinery GE and MMM, aerospace/defense BA and UTX, and big CAT. That's it. 1. economic activity concerned with the processing of raw materials and manufacture of goods in factories. Other part of Dow Theory is a transportation average - originally mostly rails, now has 20 components including Delta airline and Avis car rental. I still give more credence to ol' Charles, who viewed transportation as a vital link in an economy, the means to move raw materials to factories and finished goods to consumers... not as Florida travel accommodations for fat people... Unfortunately good transport index is hard to make, because rails don't have such huge importance anymore, air doesn't move as much stuff as it could and most of biggest shippers are either private or don't trade in US. I would be remiss not to mention Utilities average, although not part of original Dow Theory, I see utility industry as solid money making enterprise, vitally important to economy, people's every day life and progress off all humanity broadly speaking. Popular index XLU offers a pretty good representation of stocks involved. Utility portfolio strategy outlined in FMSUP article (link) can be mistakenly classified as 'index', as it has some of the traits of modern structured investing solutions, but I rather see it as a mutual fund of sorts. High position concentration and periodic re-balancing (performance drivers) designed to create an upward equity slope, leading to out-performance of FMSUP vs. industry on average (I hope) and most other mut fund managers (betting on it). I will be setting up these as Motifs for easy tracking, starting on a first trading day of the new year.